In 2002 Torsten Allander and his wife Kicki purchased the Foxtrot Vineyard, a Pinot Noir vineyard that had been planted in 1993 on the upper slopes of the Naramata Bench in the Okanagan Valley, BC. The property slopes west towards Lake Okanagan, with its complex soil compositon and microclimate , has an outstanding terroir for Pinot Noir. 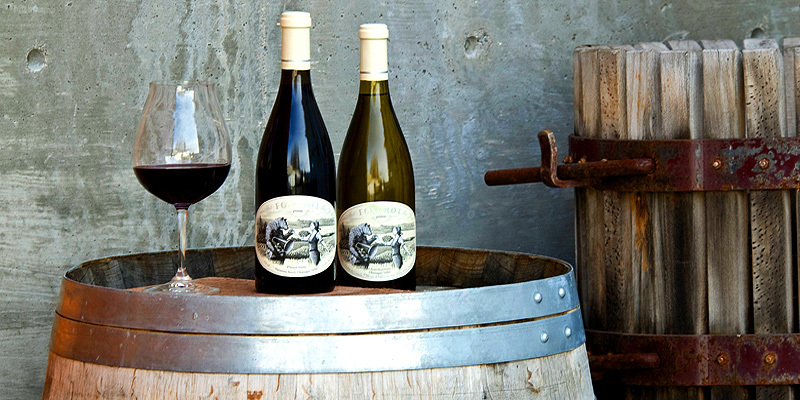 The fruit from thee vines express the entire spectrum of flavours that are the foundation of great Pinot Noirs. As Torsten and Kicki are lovers of Burgundian wines, the purchase of the vineyard was the first step towards making great Pinot Noir. Gustav Allander, Torsten and Kicki’s son, was at the time working as Assistant Winemaker at another Naramata winery. It was decided that a winery should be constructed at the Foxtrot Estate and Gustav would participate in the design and become Foxtot’s Winemaker. The initial 2004 vintage was quickly met with widespread acclaim by top Restauranteurs and wine Critics alike. Many hailed it as the best in Canada and on par with top International Pinot Noirs. With an immediate cult following of the wine, the Allander family made the decision in 2008 to add Chardonnay the portfolio. Our wines are available at select wine merchants and restaurants within Canada, Switzerland, Japan and the United States. Our distribution centre within the United States is in California. Shipments to private customers in North America, Europe and Asia take place on a regular basis. As a family owned winery the Allander’s strive to continue their commitment to producing world class Pinot Noir and Chardonnay for many generations to come.